Home / December is here! Here’s a look back at our November high “lights”…! So what were the highlights for us this past month? 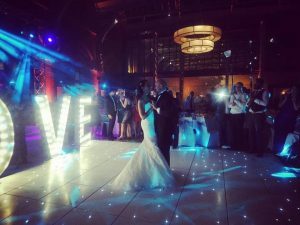 Well……we have been delivering LED wedding initials and ‘LOVE’ letters to some beautiful autumnal November weddings, such as this one at the grand and imposing Renaissance Hotel, St Pancras….don’t the bride and groom look amazing on the illuminated dance floor? 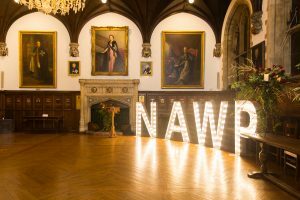 We also provided our marquee letters for this networking event for the National Association of Wedding Professionals (NAWP), at the Museum of St John, London, which as you can see from this image, is an absolutely stunning venue. Credit to Rupa Photography for the image below. 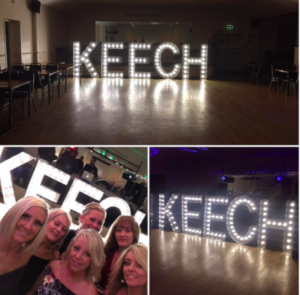 Wedding Letter Hire also lit up a charity event in aid of local Keech Hospice Care, a fantastic soul music night at St Joseph’s Club, Luton. We were so happy to hear that the event raised a total of over £11,000 on the night – what an amazing result for this very worthy cause! 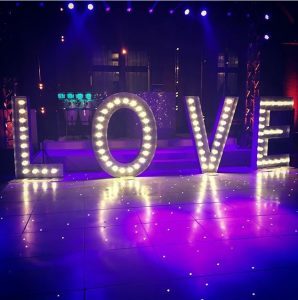 We were also very happy to receive this striking image of our 5 foot letter lights in action from our customer, Memories4U Weddings, who organised this awe-inspiring Thanksgiving event at the Hilton Hotel, Bankside, London. 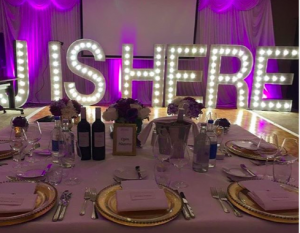 We will be back with some more news soon but for now….bring on the Christmas parties and winter weddings! ← Our letters feature at London Ski and Snowboard Show 2016 for second year in a row!